We recently moved into a new home and love the light that streams into each room, but we still need privacy and shade once in a while. Rather than spending thousands of dollars on blinds installation throughout our home, we found a fantastically affordable professional-grade DIY option from Redi Shade. Their Easy Lift Trim-at-Home Window Shades allow you to measure and install the shades all on your own, no tools required! Easy Lift Trim-at-Home Window Shades come in light filtering and light blocking density options. They are made of polyester fabric (either pleated or cellular styles), which can be easily raised and lowered to your desired height throughout the day. We installed three windows in under 10 minutes with just a kitchen knife to trim each shade to size. It's a great beginner level DIY project for any home! Step 1: Measure the inside width of the top, middle and bottom of your window. Step 2: Mark the smallest measured width onto the guide found on the shade. Step 3: Slide the trimming guide to the mark you made on your shade. Step 4: Use a simple sawing motion to cut through the plastic and fabric. Step 5: Remove adhesive tape. Firmly press shade to the top of the window frame. Step 6: Gently pull the shades down to your desired length. Enjoy! Always cordless, making them safer for children! 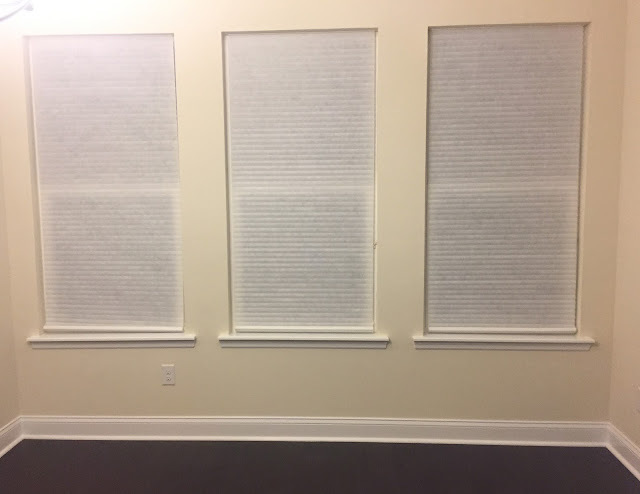 This was one of the easiest DIY products we have done in our new home and it has saved us a lot of money compared to the cost of professionally installed shades. At only $25 a shade, we couldn't beat the price and love the look of these window treatments. Use Redi Shade's store locator feature here to find a location near you or shop online to have your order shipped direct to your door. Disclaimer: The product in this post was provided by Redi Shade. As always, our posts are our own, honest opinions.